THE PICKIEST EATER IN THE WORLD: BUFFALO WILD WINGS: WINGS. BEER. SPORTS. NOW IN THE PHILIPPINES! BUFFALO WILD WINGS: WINGS. BEER. SPORTS. NOW IN THE PHILIPPINES! 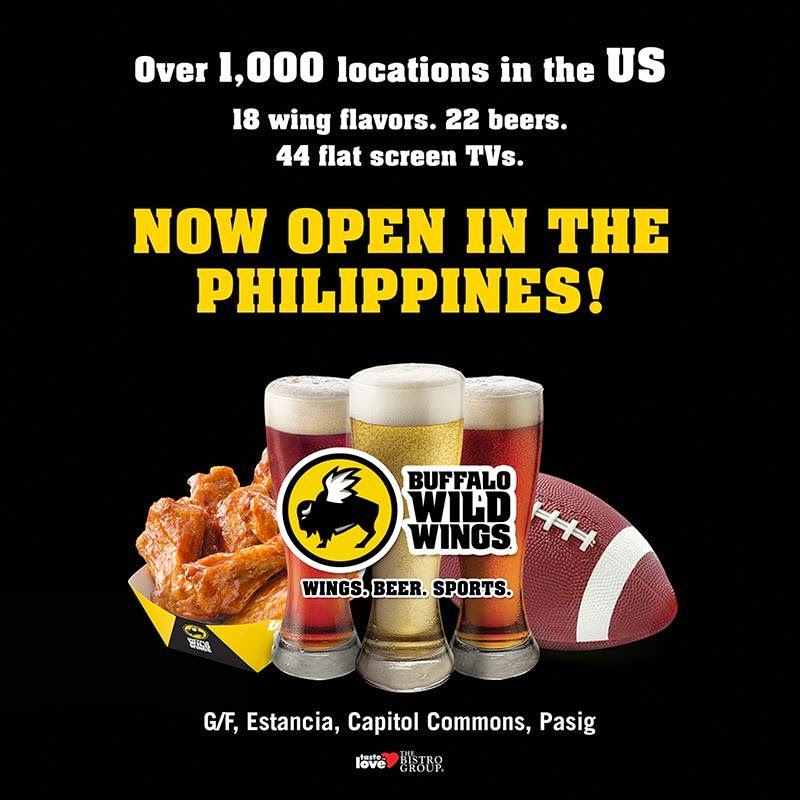 Already boasting of 1,000 locations throughout the world, including outlets in every state of the USA, Buffalo Wild Wings finally opens in The Philippines! 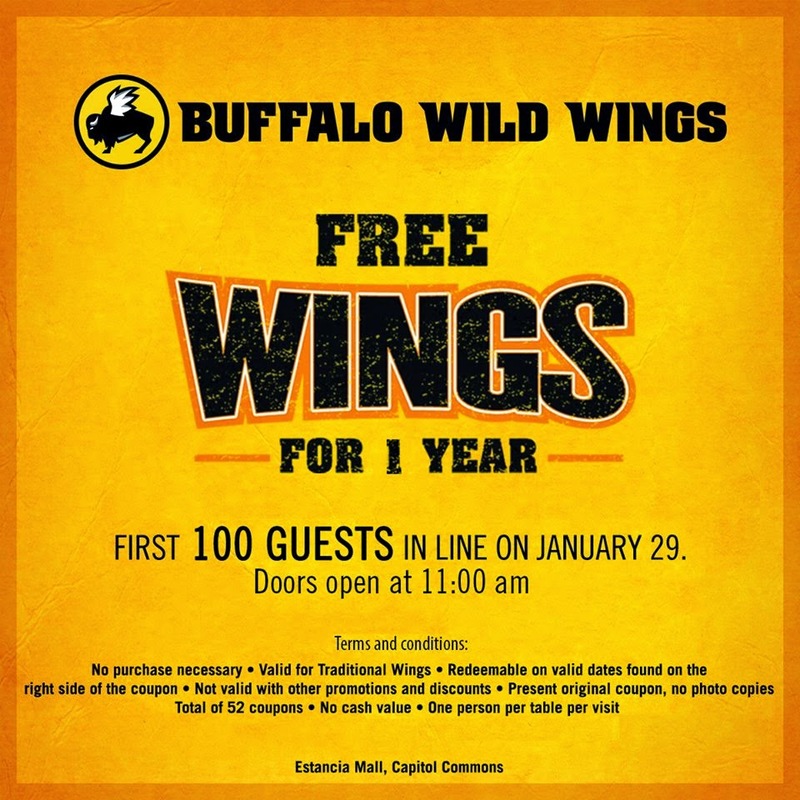 And what better way to celebrate its Grand Opening on January 29 than by giving away a year's worth of wings to the first 100 people in line when the doors open at 11am! Brought in by the people at the Bistro Group, Buffalo Wild Wings has found a new home at the sparkling new Estancia Mall in Capital Commons, Pasig! B-Dubs is known for it's delectable wings, and its 16 signature sauces that they offer. The flavors range from Wings with no heat to it - Sweet BBQ, Teriyaki, Garlic Parmesan and Honey BBQ.. To the fiery - Jammin' Jalapeno, Desert Heat, and the Blazin'.. The hottest sauce on Buffalo Wild Wing's Menu! So get ready on January 29! Don't miss your chance to win a year's worth of Wings! Terms and Conditions do apply, so please read the fine print carefully. May the odds be ever in your favor!! This is the best place for Saturday night out beer and chicken wings. This place is just around in Pasig. Very accessible place. Very good for group of friends who wants to hang out after their tiring week. Must try to visit, very cool place.